This is a remaster of a recording by someone from the audience on the night (update: that person has got in touch with some more details - see the comments section below). As such it might not be as clear as most of the gigs on the archive (especially the first track, where the sound engineer on the night took a few minutes to get things sounding ok). 2016 has been a bad year for many. It was also the year David Bowie passed away which affected me and many others more than I guess we would have thought, so I wanted to do something from him to close the year as a mark of respect. This gig catches him coming towards the end of his first proper US tour. 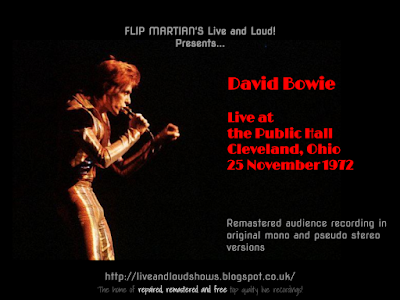 The recording - recorded in the crowd, on tape, over 40 years ago is a remarkable record of a great gig, with Bowie chatting in between songs. I spent more than a few hours on EQ'ing this but fortunately otherwise there wasn't too much to do. There are a couple of instances where the song fades out and back in - these were on the original recording and have been left as is. The original recording is in mono, so I took the opportunity to do a simulated stereo remaster as well, as a separate exercise. So now you have a choice, you can have it in remastered mono, or you can have the "stereo" version. Or of course you can download both. Both are 1 MP3 file. Or, if you would like to have separate tagged MP3s, or even lossless files in FLAC format, head on over to the Donations tab to see how you can obtain these for a very small donation towards the site costs. Incidentally, if anyone sets this up as a torrent - that's ok but if can you let me know and credit this page as the original source of this version in the accompanying docs, that would be cool. Ultimately the more fans hear these the better, so I'm not going to get precious about it! Cheers, you're very welcome. Enjoy. Joe, thank you so much for that information and for getting in touch. I'll update the graphic to show the Public Hall. I'm guessing the copy I had to work on is several generations away from your original; I would have loved to have been able to take a copy from that - but I hope I did it some justice with my cleaning up. Those photos you have must bring back great memories; what I would have given to see him at that time. Thanks for recording the gig, its priceless. Feel free to contact me anytime.